I enjoy running. A great marathoner and cross country runner, I am not. But I am a general enthusiast who will run an occasional 5k race and has aspirations to train for longer events. I lack rhythm. After roughly nine years of piano lessons, recitals and competitions, one would think that enough practice would generate some level of inherent beat. Alas, my wife and I have wisely chosen to forgo dancing because the only way I avoid stepping on her toes involves a continual tap, tap, tap on my shoulders. Our family likes to do things together. Well, really our boys don’t have much choice. So several times they “get” to participate in family runs. Jonah, Jesse, Jeremiah and even Joey get caught up in the thrill of racing around our long country driveway. One member however, fails to feel the same joy. One particular Saturday we all embarked on a family run, and I led the way. Jacob, our oldest, was reluctantly keeping pace with us at first. As the run wore on, he started to slip to the rear of the pack. Being the all sympathetic and compassionate person I am, I slowed my pace and ran beside him. Of course, then I started yelling, “Come On! You can do it! MOVE! MOVE! MOVE! Push yourself!” He tried to pick up the pace but that only lasted for spurts. Again, my great compassion coming out, I hollered a few more “encouraging” items and pushed ahead to some of the other brothers. Growing up, coaches had yelled and pushed. That method had driven me; it should work on my boys as well. Through the rest of the run, I noticed Kelly had fallen in stride with Jacob. We completed the agreed distance and started our cool down walk, the boys well in front with Kelly and I following. “Why can’t Jacob push himself more?” I whisper to Kelly. She paused and waited for the distance to the other boys to widen. “He’s not like you,” she responded. “Do you know what he told me?” she quickly asked. Recently, I sat in the second to last row of a university concert hall with my family taking up almost one-half of the row. We were there to hear Jacob’s fourth band recital of the last two years. From the age of seven on, Jacob asked to play the drums. We tried to push piano and even thought we could “wait” out his desire. Drums echoing through the house gave us concern. At age 10, however, Jake’s desire had not subsided and we decided to give it a go. Even from the start, we remained reluctant, unwilling to purchase a full drum set and only buying the basic practice pad. After only a few weeks, the drum instructor said he would benefit from the real deal. Still trying to measure commitment level, we agreed to only pay half of the drum set. Jacob didn’t hesitate a minute and invested his own funds for the other part. Fast forward three years. The jazz band instructor walks off to the side of the stage. Jacob hits the high hat and toms to start off the first song for the group. Through five songs his steady beat paces the group as the jazz band becomes the highlight of the evening. The first thought in my head – I am deeply, deeply humbled. My oldest has persevered in a field of rhythm, something that would seem impossible for me. Not only has he persevered, he has found joy in the endeavor. Second thought in my head – God has blessed our family with people that have varying gifts and talents. Out of this diversity of gifts comes a great beauty. My head bobbed and a smiled crossed my face as I continued to listen specifically for the drum in every jazz piece. My smile grew as I saw Jake’s focus and determination. He may not ever run a 5k race but he has already accomplished something that has evaded his father for years. 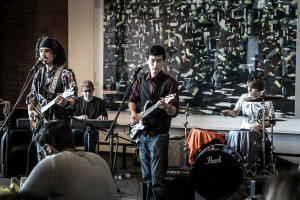 To hear some of Jacob’s drumming, check out the link https://vimeo.com/119917173 or click on the above picture of the band. Both links redirect to our Vimeo site. UPDATE – This original post was written several months (if not a year) earlier. 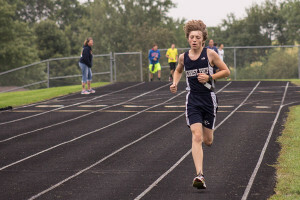 Since that writing, Jacob willingly chose cross country as a fall sport and has amazed all of his family with a very strong first-year outing. For never running a 5k race, Jacob ended the year with a personal best of 21:30 at the national tournament. During the winter he has continued to practice and looks forward to partaking in his first track experience during the spring of 2015. While I would love to write that my “motivational” speeches were the driving factor behind his choice, I tend to think the social aspect of participating with friends played a stronger role. 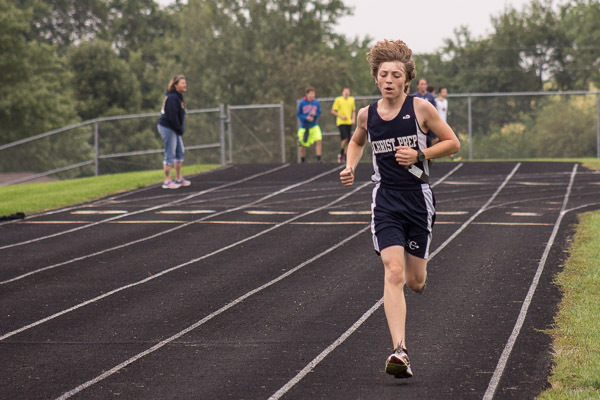 Regardless of motivation, Jake has again shown great focus and added another level of diversity for the Buss family – no one in the immediate family has ever participated in cross country. I enjoyed your latest blog so much. It is evident that the lines of communication are open in the Buss home. That is not always easy to do. I’m sure Uncle Paul would love a drum recital.